The picture shows Monty lying in the shade by the garage last week when the weather suddenly got warm. That is actually a very nice place for him because the surface of the brick patio feels cool in the shade there. Spring in Wisconsin can be challenging for little black cats. As soon as he sheds away his winter fur so he can be comfortable in the hot weather, it turns cold again and Monty shivers. He actually refused outside time for two days after the heat wave, and he normally will go out in just about any weather or any temperature. He was getting a little cranky I think, first being so hot, as he is in this picture, and then having to revert back to winter like temperatures literally overnight. As much as the humans complained about it, they could just grab their summer clothing out of storage, and then put a jacket on when it turned cold again. I put on a pair of shorts that first hot day and felt so good! Poor Monty. His winter coat was still on and by the time he could get it off for summer it was winter again! No wonder he was cranky. I spent three days chasing Monty around with his brush trying to get as much fur off him as I could so he could be more comfortable in the heat and not have hairballs. I almost felt bad about pulling so much fur off him when it turned cold again, but it couldn’t be helped. I suppose his little body is busy thickening up his coat again, while at the same time, summer is just around the corner. If you are a cat, getting your summer wardrobe out of storage and packing away your winter clothing is a time consuming process compared to what we humans do. I often am envious of Monty in the morning when I get dressed for work, because while I can’t decide what to wear, he is all ready to go. I say, “What are you going to wear today, Monty? Oh, I see, you’re going to wear your little black fur coat. Great choice!” He’s all ready for his day the second he wakes up. But I did not envy him when I realized last week that he cannot take off the winter version of that fur coat in the same way I can shed winter layers and store them in the closet for easy access should the weather turn cold again. 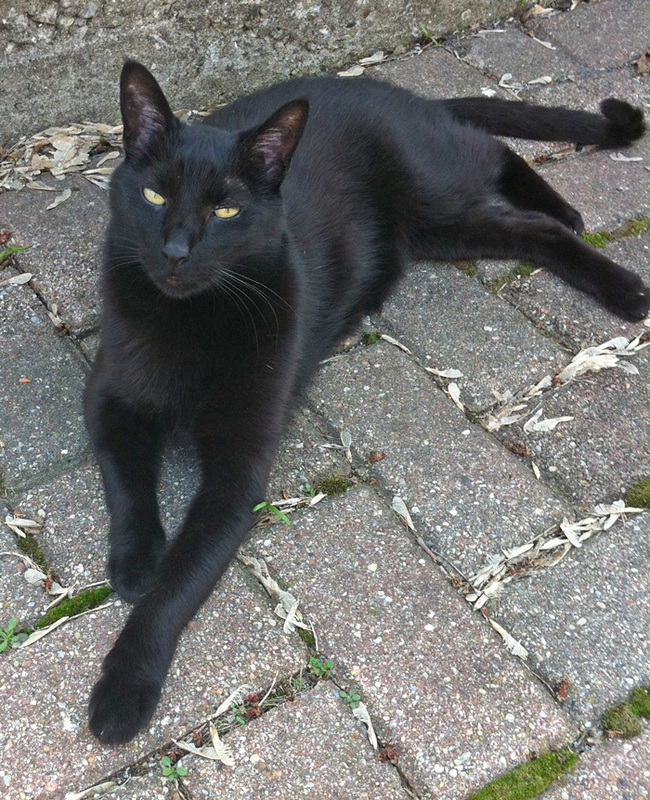 This entry was posted in Cat Anatomy, Cat Coats and tagged black cat, cat coats, monty by Michael Broad. Bookmark the permalink. I seldom leave a response, but after reading through a few of the responses on this page Winter Coat to Summer Coat and Back in Five Days. these responses look as if they are coming from brain dead folks? Monty is so very handsome! Our boyz like to lie on the patio slabs to cool off when it’s hot, they roll over legs up in the air and they both love ‘dust baths’ They find a dusty place and roll around and they get covered in it and have to be brushed which they both enjoy. He may look distinguished, but actually he was just hot! He is usually bright eyed and alert. He was just kind of droopy in that heat– his eyes aren’t even open all the way. You get snow, Elisa– just not very frequently and it’s probably never good for cross country skiing. You need just the right temperature for that– too cold and it’s slow snow (which can be ok in hilly terrain) too warm and it’s slushy and sticky. You would absolutely love cross country skiing, Elisa. But other than for skiing it’s kind of useless. You get sick of scraping it off your car, it makes driving interesting, and when it falls on frozen lakes and ponds it can ruin the ice for skating or prevent it from getting thick enough to skate on, because it’s an insulator. Excellent photo of a very handsome cat. It’s he a very fine looking black cat. His coat looks great. Thanks for posting another little story about Monty! He is a handsome boy, but he was very uncomfortable that day. His expression says it all. In some ways I didn’t enjoy the sudden heat either. We keep our furnace set at 58 degrees Fahrenheit all winter. We all get used to that, none of us more than Monty who is here 24/7 unless he’s outside where it’s even colder. I turn the heat up to 64 when we have company or if I have a flute student. That is as high as it goes as our furnace is ancient. I have a Facebook friend who runs a cat rescue in Missouri. She is required by law to keep the cat shelter at a minimum of 65 degrees. It can’t drop below 65 degrees Fahrenheit for any period greater than four hours. To me that’s just silly, because, as you say, cats have their overcoats on and don’t need a lot of heat inside the house. Also, most of her cats were strays. Until being brought to her rescue they were living outside! I had to laugh that our house would be too cold to legally run a cat shelter out of it. Watch you wish for if you’re wishing for Wisconsin weather. Just a few days ago northwestern Wisconsin got 14 inches of snow! That very interesting about the law for shelter temperatures. I agree it’s a little over the top. It’s probably a bit healthy for cats to negotiate some kind of temperature change after all. Monty looks like Charlie and my Lilly 🙂 Black cats are always so healthy and never overweight in my personal experience. Lilly has a perfect appetite and looks just like Monty in size – very healthy looking. The other two are in danger of getting overweight already whereas Lilly is always fine with that. I wonder how hot they must get with those black coats – in the sun. I know Lilly likes to lie in sun puddles and her fur gets so so hot. She likes to be on the radiator in winter too – I guess she likes the heat alot. I have a fan for my cats in summer and I leave it on gently for them and they seem to like it. I agree about the shelter temperatures, Marc. I can’t remember precisely, but I think they are allowed to have it up to 85 degrees Fahrenheit during the summer, but it can’t be more than 85 for a period greater than four hours. I could be wrong on that, but whatever it was, I thought it was awfully warm. I would never let my house get up to 85 degrees. On days I fear it might (since our air conditioner is not great) I leave the basement door open for Monty so he can go down there to cool off. Maybe the climate is so much warmer in Missouri that the residents there consider 65 degrees to be cold and 85 degrees to be tolerable. But they are putting human comfort into the equation. Cats have fur. I think they need it cooler. I read that if a cat is kept in a constant temperature all the time he will shed constantly. I have seen this with indoor cats. Monty only sheds at this time of year and during the heat of the summer at times. He doesn’t shed at all during the winter months and as he is growing his thicker winter coat. I think it is normal and healthy for a cat to have to deal with some changes in temperatures, but I think that, just like for the rest of us, sudden changes are more difficult to deal with. We are told that it is the amount if ambient light that dictates whether a cat sheds fur or not. I am not sure it is as straightforward as that and in any case cold weather, usually, accompanies less light and vice versa. I don’t think it’s the light. We get very bright sunny days in winter. When Monty is out there walking around on the snow it is blinding. You can get a sunburn in winter from exposure to all that light reflecting off the snow. (Luckily not much skin is exposed, but I’ve noticed redness on my face after being out a long time on a bright snowy day.) if it were light doing it Monty would shed after being out in that blinding winter sunlight as it reflects off the snow. If anything he gets less light in summer as he sticks to shady areas. In winter the blinds are open to warm up the place. In summer the blinds are closed to keep it cooler. Also, our days were getting longer steadily right along, as they should at this time of year. But the temps have been a good month or more behind. Monty didn’t shed until the temps warmed up. Last year summer came early, before the days had significantly lengthened– it was 80 degrees Fahrenheit in March. But as soon as it got hot Monty started to shed like crazy. If it were all based on light the cat who is transferred to a warmer house would be stuck with his heavy coat. Considering the dazzling brightness of sunlight on snow, I don’t think light can play a role at all. I love the way when the sun shines on a black or black and white cats fur, you can see the stripes that all cats have. Monty has those stripes– even rings around his tail! First things first. He is truly a handsome cat and it looks like he knows it 😉 Also as I said before he is the spitting image of Charlie except for the extra leg. Really nice photo too. I am pleased you have picked up on the point of a cat’s coat. We sometimes forget that a cat has an overcoat on when inside the home. We turn the heating up etc. but cats can’t take anything off. I sometimes think cats cope better in cold weather. Black fur absorbs heat effectively in sunlight and gets hot. I know Charlie will find shade fairly quickly. Wisconsin weather is more extreme it seems than London weather. That causes the complications you mention. I wish we had your weather “problems”. At least you have seasons.